Easter is just around the corner. We pulled out all of the plastic eggs, bunny ears and Easter books. Now you just know that a regular old egg hunt is not going to fly around here! 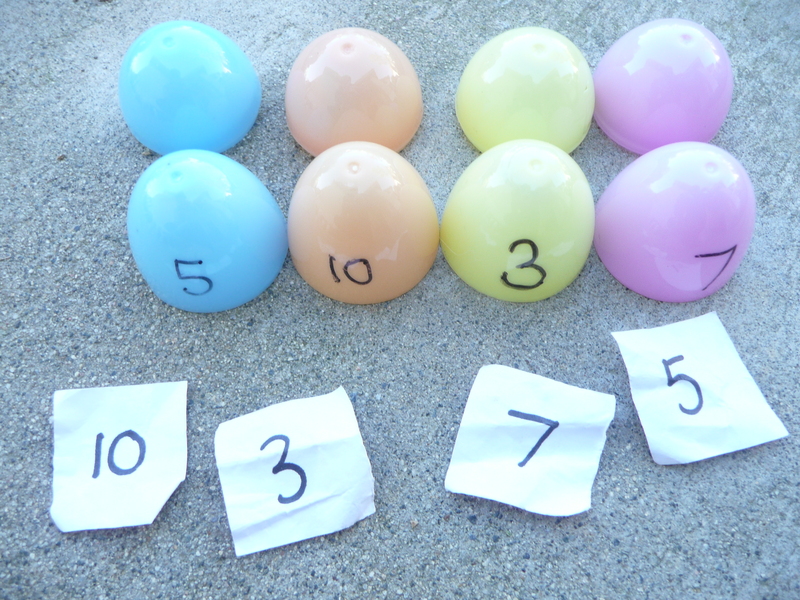 It took a little extra prep, but I worked out a really fun number recognition game with our Easter eggs! I started with 10 eggs, on the outside of each egg I wrote a number. 1, 2, 3, 4. . .10. I also wrote the numbers on a sheet of white paper. I cut the paper into small squares. 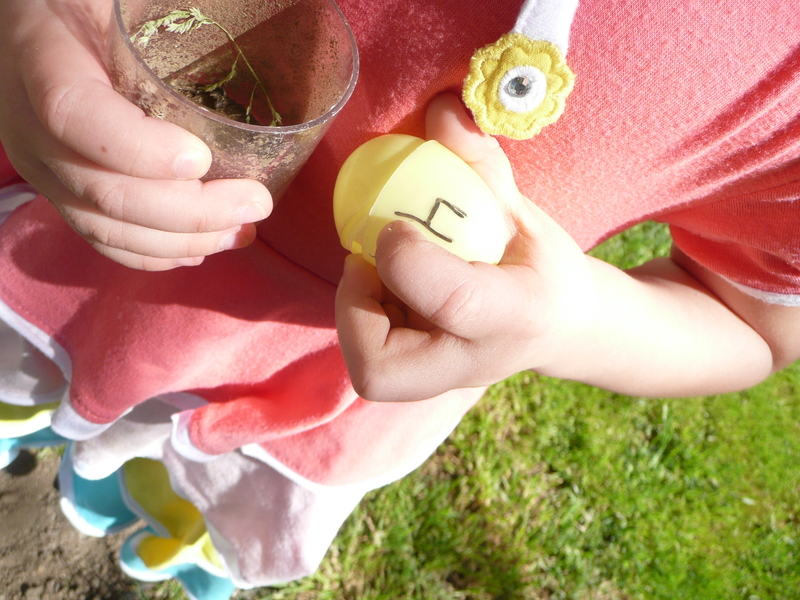 I wanted the kids to find an egg (any egg) and then look inside for a number. They were then to find that number on another egg. In order for this to work the eggs have to be stuffed just right. This part took me a few minutes to wrap my brain around, so I apologize if I’m simplifying it too much. I laid out all 10 eggs, making sure not to put them in order. Then I laid the papers in front of the eggs. The number went in front of the egg to the left. 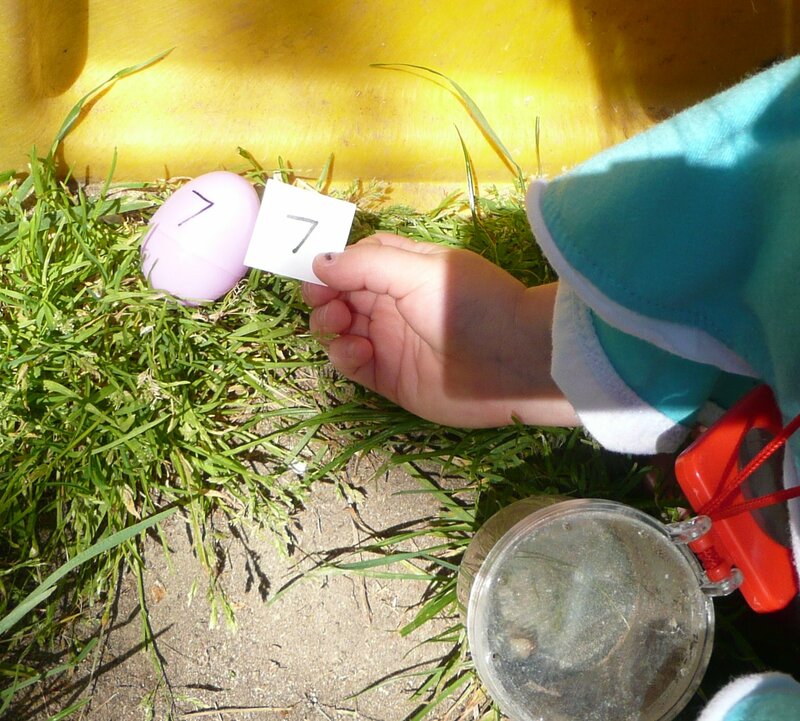 For example, the number 6 paper was placed in front of the number 3 egg. 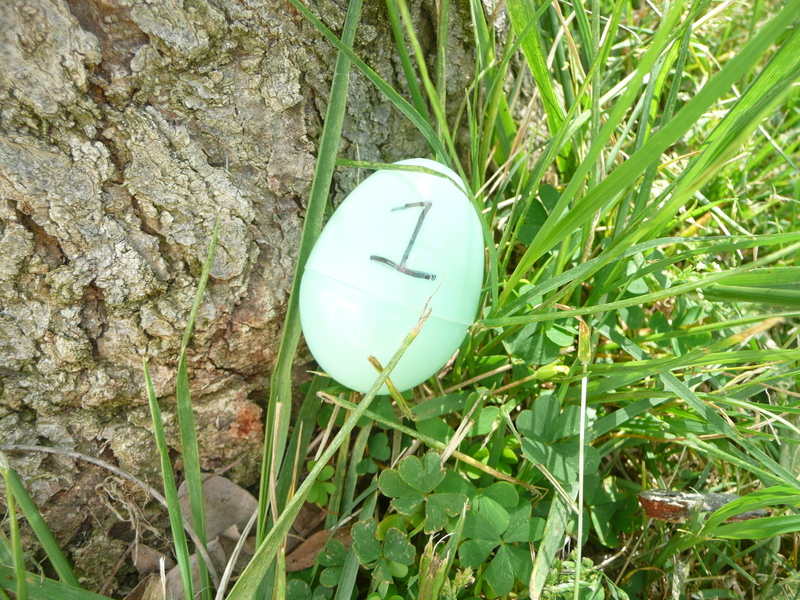 For the last egg, the number should match the number on the first egg. 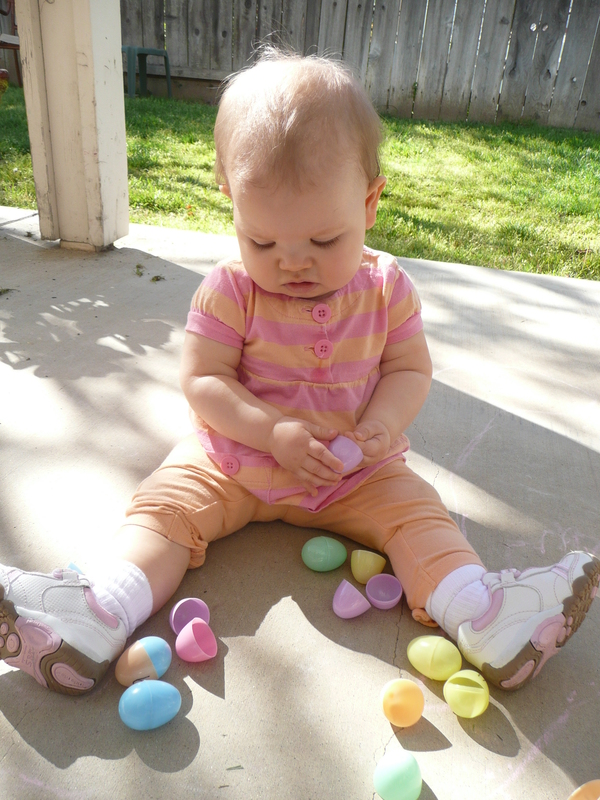 I hid the eggs around the yard, making sure not to hide them too hard. The best part with this type of game is that it doesn’t matter if they peek! Little M is still working on her number recognition, so I had her carry the number with her. It was a great opportunity for her to practice this important skill. Tips (to maximize learning): 1. If your kids have already mastered 1-10, add in 11-20. If you have older kids make it more challenging. Wouldn’t it be fun to try 1- 50? 2. Use this game as a memory sharpener. 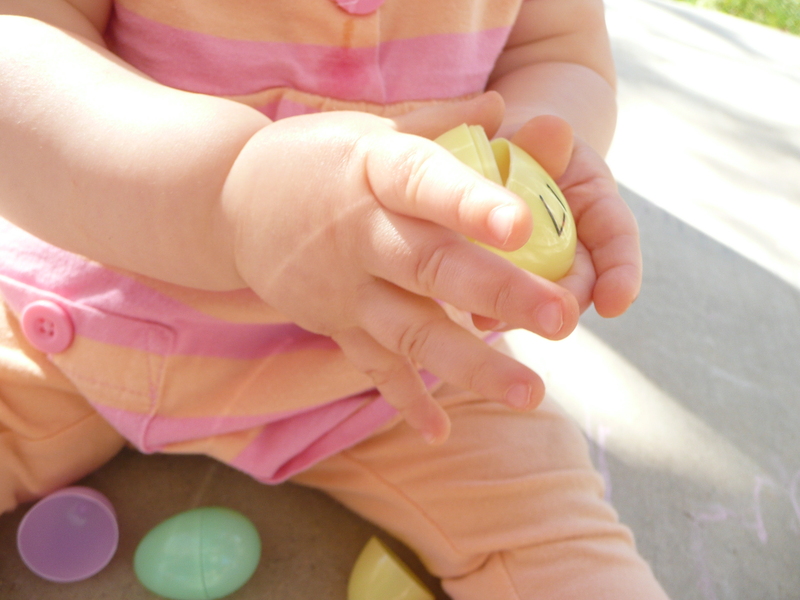 When your little one comes to an egg that doesn’t match the one they are looking for, say the number out loud. (Or ask your little one to!) Then encourage them to think about where they might have seen the number. By the end they should have seen all of the numbers at least once. 3. This one works for fine motor too! Have your kids help stuff the eggs, putting plastic eggs together takes quite a bit of concentration. Do you have any unique ways of playing with your Easter eggs? This is such a great idea! I am so doing this during my Easter week lessons. I loved this idea. 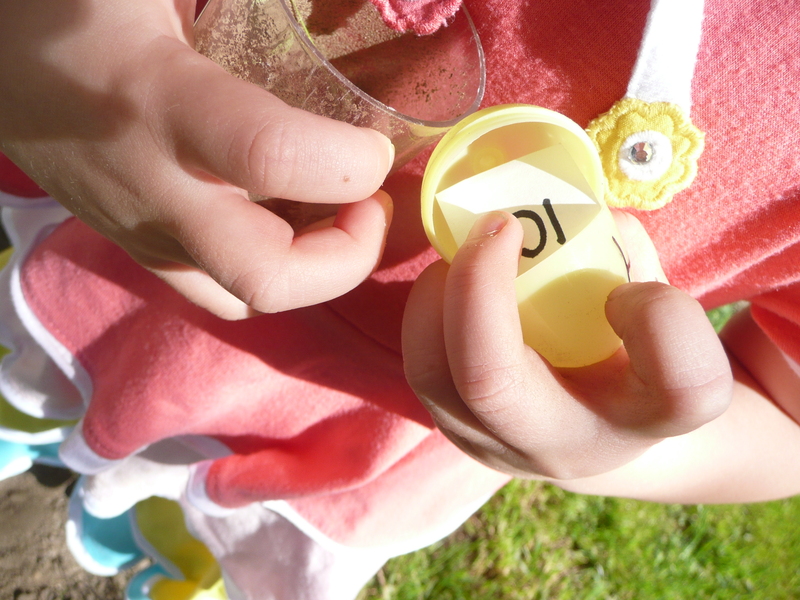 I had planned, as many others, to have an Easter Egg Hunt, but wanted a way to make it more educational. This idea definitely fir the bill. I love this idea! I’m curious, how old is your little one doing this hunt? My daughter will be two in June so it might be a little hard for her this year, but next year we could give it a go. Thanks for sharing!